As far as I can tell I’ve always been a Disney fan. I eagerly awaited the newest Disney movies to come to theaters and we bought them when they came out on VHS. 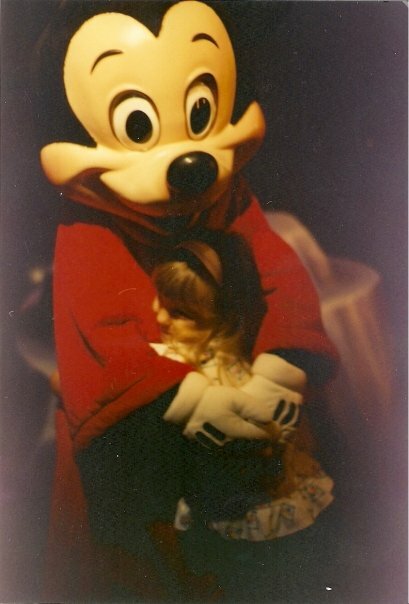 I loved my trips to Disneyland as a child. I read over and over the pamphlets we would get from Get Away Today from school to the point of wearing them out. I love the characters (Tinkerbell was my favorite as a kid and I still love her, but I love many of the characters now) and I had some of the Disney Barbie dolls and even wanted more of them than what I had. 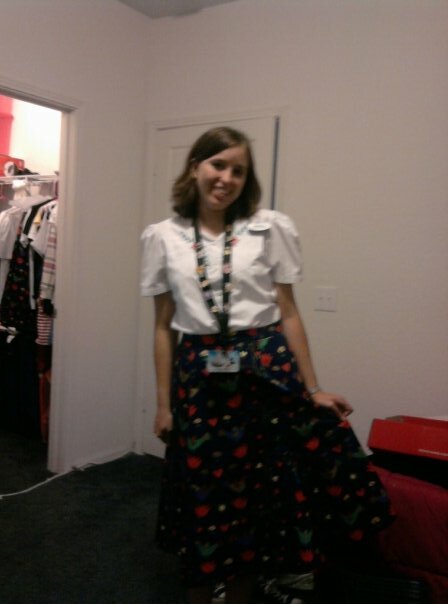 It wasn’t until my trip to Disneyland in 2003 that I realized that I could actually work at Disneyland! I was visiting the park for my high school’s marching band trip (it was this same trip where I first fell for my sweet husband). We talked to this sweet lady at the rope drop and I realized that people actually work in the parks for their job and that is what I wanted to do. 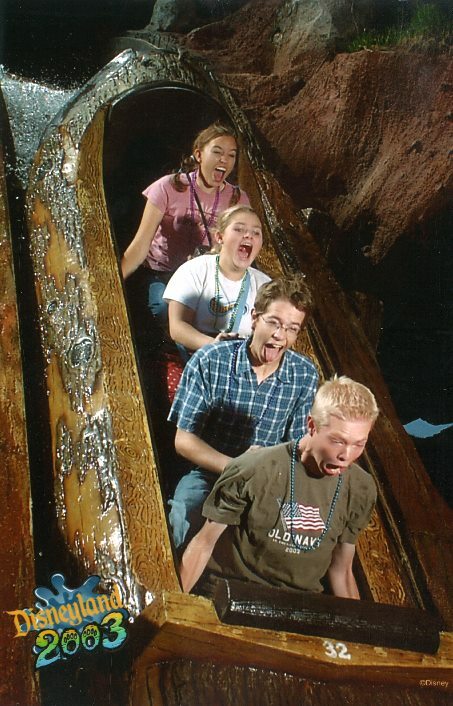 I had a dream of working at Disneyland on Pirates of the Caribbean, because that was my favorite ride. Who Knew I’d marry the guy in the 2nd row! Fast forward to college to where I learned about the Disney College Program. For those of you who aren’t familiar with it, the Disney College Program is a paid internship where you work at either Walt Disney World or Disneyland for a few months and learn about the company. I knew I had to do it so I applied to work at Walt Disney World. 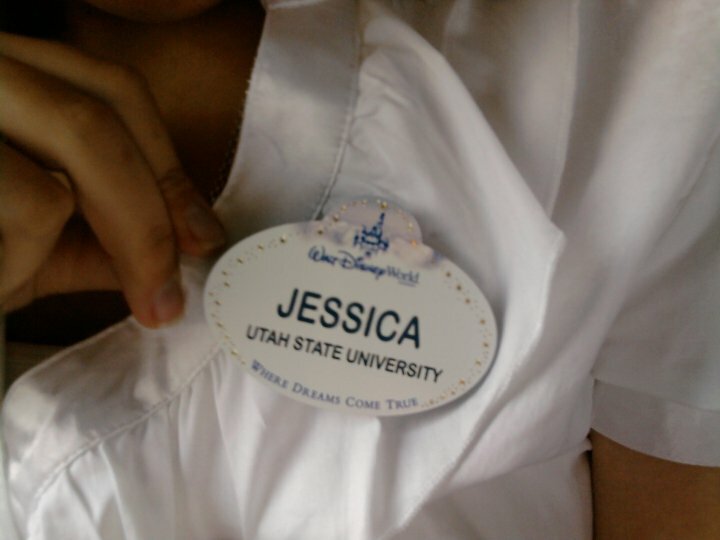 Why didn’t I apply for Disneyland so I could fulfill my lifelong dream you ask? Well, I figured this may be my shot to ever visit Florida! Plus the fees were a lot cheaper at the time that I did it and the chances of getting in were greater. Back when I applied, they had in person campus presentations where a recruiter came to talk about the program. 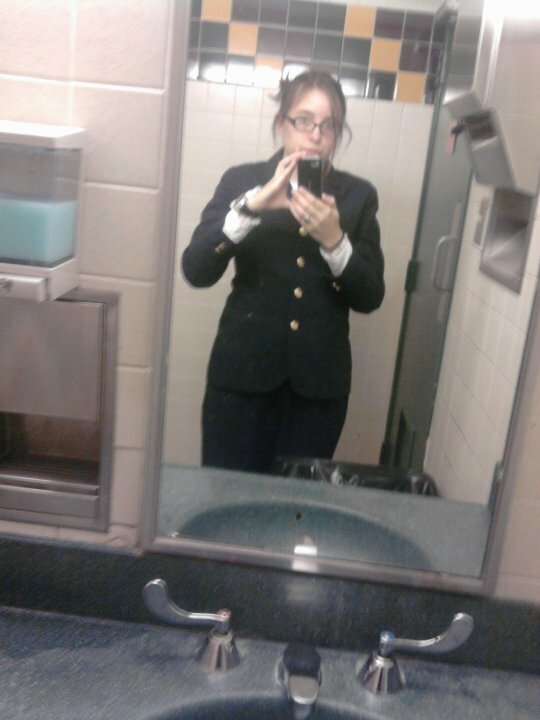 I made sure to dress up professionally and introduced myself to the recruiter. He wasn’t the one who made the decisions or did interviews, but I wanted to make a good impression nonetheless! I immediately went and applied for the program. I was then able to schedule a phone interview for a future date. Needless to say I got in! During this time I joined an online internet forum called the Disboards. This site was full of other Disney fans like me (and some even bigger I’d say!) and I even made some good friends on there that I got to meet in person down in Florida like Jessica, Nick, and Cordi. 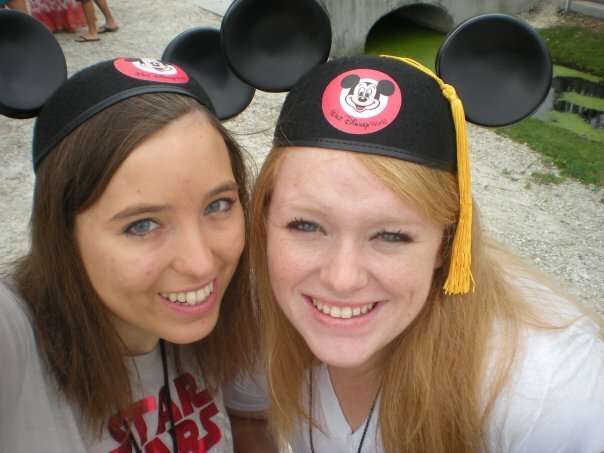 So even before I made it down to Florida I was immersing myself in the Disney fandom. My name tag, which I still have! Some people worry that working for Disney will ruin the magic for them. For me it actually made the magic all the more greater. I loved seeing what went on backstage to make the show onstage all the more greater. Sure not everything backstage is pretty, but the parts that guests see on the rare occasion or on special tours are kept nicer. Even so, those not so nice places aren’t all that bad. I worked Fantasyland doing merchandise and then I extended my program (because I loved it so much) and worked Main Street Operations (parade audience control aka PAC and turnstiles). One of the Main Street Operations Costumes. It was my favorite! They’ve since changed it too. Through these roles I learned that the company is far from perfect, but there’s a reason they excel in customer service. I got to blow bubbles with kids and call Tinkerbell to come say hello in my role in Fantasyland. As a PAC cast member, I got to jump rope and play games with kids. Sure I had to work too but it was always great when you gave a sticker to a child and you got a smile back like you’d just given them a key to the castle! Working at Disney really put me in the Disney mind. Of course I went to the parks a lot because hey, I got in for free. I went with my friends and roommates. Birthdays were celebrated in the park and holidays as well (okay we celebrated those early in park because lets face it, it’s gets too crazy in the parks during holidays). My roommates were great Disney fans as well (shout out to Lauren, Brittney, Amanda, and Heather). I can honestly say that if I thought I was a Disney fan before working there, I’m even more of a Disney fan now! One thing I got to do while down there was take a class. I chose to take Disney Heritage, which is basically a Disney History class. Believe me when I say I was disappointed that I didn’t have homework in this class, because I would have loved to! It was a great class taught by David Horvath. I learned a great appreciation about what Walt has built and how he built it. I can honestly say that when I get to Heaven, I want to shake his hand. You don’t have to have worked for Disney to be a major Disney fan. Some of the biggest fans I know have never worked there, like my great friends the Riley family. They actually were down at Disney at the same time as my parents when they came to visit me, so I got to spend time with them as well. When I get together with them, we talk a lot about Disney and just ask Sean, I’m in my element. Walt Disney World has become my home, but I still love Disneyland because it’s the park I grew up with. Unfortunately I haven’t been back to Walt Disney World since I had to come home in 2010, and it’s been even longer since I’ve been to Disneyland (over 10 years). Here’s to hoping we can go and when we do I’ll be using Get Away Today because they’re easy to work with! 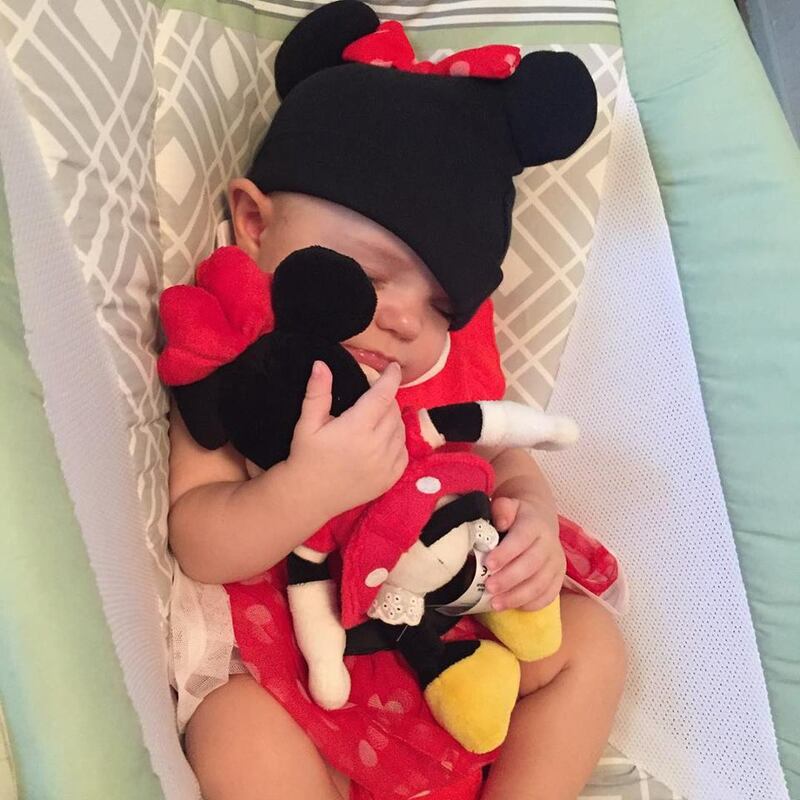 I’m already raising her up as a Disney fan! There are a lot of great ways to connect with fellow Disney fans. I’m a part of a few Disney groups on Facebook, there’s multiple forums out there (like Disboards that I mentioned above), as well as Tumblr has a big Disney following. Oh and there’s some great Disney blogs out there too ran by fans (my favorite is The Disney Blog). Disney even has it’s own fan club call D23 which just had it’s huge convention over in Anaheim. You can join D23 for free, but it has paid levels where you can get exclusive content and go to events. Currently I’m a member of the free portion, but someday I’d like to join and get a Gold membership. There have been some great things that have come out of the Disney Fandom. One of the most prominent is called “Disney Bounding“. Disney Bounding is where you wear an outfit inspired by a Disney character or sometimes an attraction. Many people choose to Disney Bound to the parks because of Disney’s strict rules on adults wearing costumes in the parks. You can also see Disney Bounding happen at Disney events like broadway shows or Disney on Ice. 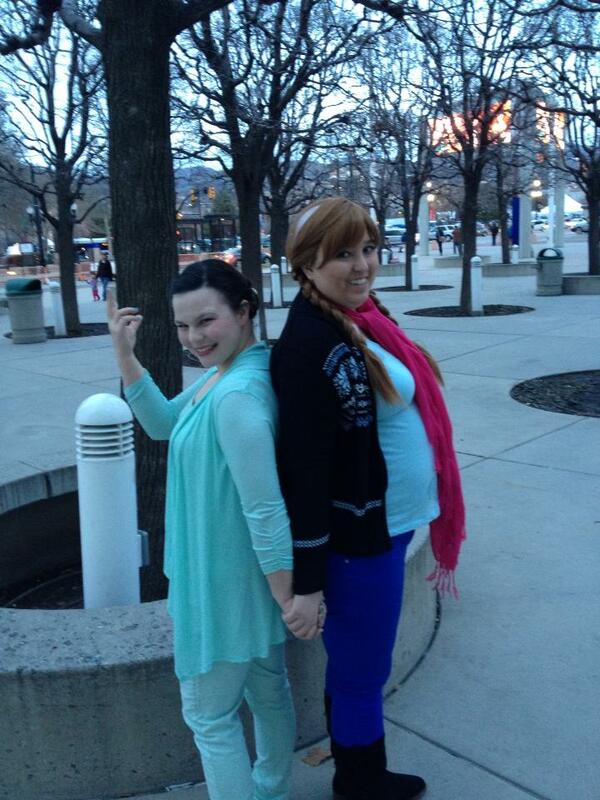 I myself Disney Bounded to Disney on Ice with my friend Mckenzey. We went as Anna and Elsa! Back in the day, people used to dress up to go to Disneyland. Well, some people started what is called Dapper Day. Dapper Day is a day where some guests all go to Disneyland (or Walt Disney World) dressed up as if it were the early days of the park. Girls are usually wearing dresses and guys wear button up shirts with suspenders and bowties (or any variation). Some fans will even come up with Disney Bound outfits for Dapper Day, combining the two. I’ve yet to attend a Dapper Day event, but there’s a website where you can learn more about future events. Another fun thing to come out of the fandom are Disney inspired bows. One of the more popular shops is Magical Ribbons but there are multiple shops on Etsy as well that sell these types of bows. Even Hot Topic sells them (this is where I’ve gotten mine). These bows are a cute way to show off your fandom. I currently have an Ursula bow, a Peter Pan bow, and an Up bow. Of course I can’t leave out Disney Cosplay! Disney Cosplay is something that I’m active in, though I hope to get even more active with it. It’s a lot of fun working to bring to life a Disney character! 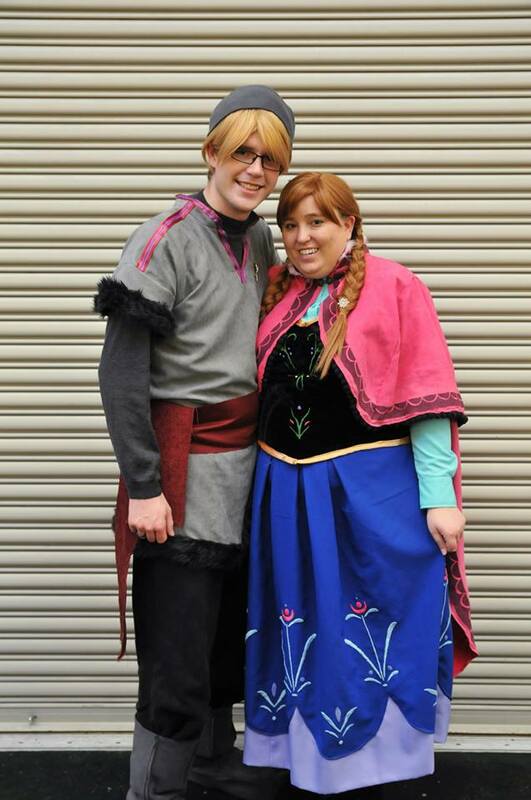 I’m most proud of my Anna costume as I painstakingly hand embroidered the entire skirt and top (okay it wasn’t that bad, it just took a long time). The whole costume turned out wonderfully and it makes me happy when I’m able to bring a smile to children’s faces. Disney Cosplay is an awesome way to be able to transform yourself into a character without having to work in Disney entertainment. Expressing my fandom to others is pretty easy as I’ve got quite a few Disney shirts, awesome Disney Vans, and loads of memorabilia. No matter how you choose to express your love of Disney, or even if it’s not that big of a love, it’s a great fandom to be a part of! I thought I was a Disney fan, but you’ve taken it to a whole new level! My husband and I are going to WDW next month! It will be his first time going, and I’m SO excited to introduce it all to him! Enjoy! It’s different from when I was there last (over 5 years!) but it’s still my home away from home! Take it all in and if you don’t get everything done, that’s okay! I lived there for 9 months and still didn’t do everything!